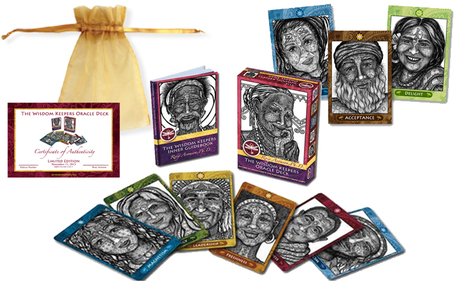 When you purchase a Limited Edition Wisdom Keepers Oracle Deck on this website, you will not only receive a mini-Inner Guidebook, but also a golden organza bag and a Certificate of Authenticity, numbered and signed by Rosy Aronson. All Oracle Decks include 64 (+ 1!) cards and a 156-page mini-Inner Guidebook, which offers detailed messages from each Wisdom Keeper, questions for contemplation, and suggestions on how to work with the cards, and integrate the guidance they bring. ​With this order, you'll also receive a set of 3 Wisdom Keeper Gift Postcards that you can send to the people you love! If you order two decks, you'll receive 2 sets of postcards. Wisdom Keeper Bookmark, and will sign your Inner Guidebook! This order combines a Limited Edition Wisdom Keepers Oracle Deck (including the mini-Inner Guidebook) AND the 300-page enhanced Inner Guidebook to accompany your deck (or to give as a gift!). This order also includes a golden organza bag, a Certificate of Authenticity numbered and signed by Rosy Aronson, and a Wisdom Keeper bookmark... all at a great discount.